Skyport has released the eighth episode of ‘Taking Off’, a video series with host Mikaela Pearman that highlights the airport redevelopment project, with this week’s video highlighting the renovations on the existing airport. Speaking in the eighth episode, Mikaela Pearman said, “Everyone knows we are busy building the new airport terminal, but did you know that we’ve done renovations on the existing one? “The current facility was in pretty bad shape, so we managed to get a few things done to elevate the customer experience. 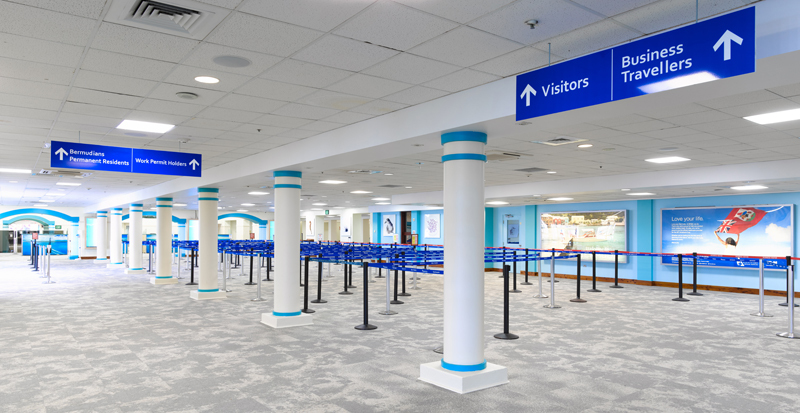 “The entire passenger terminal has new carpeting and much of the water damage has been repaired. There is new signage and new ceiling tiles. “And the space looks much better thanks to a few coats of fresh paint. The roof has been scraped and repainted. “Additionally, the terminal is cooler due to new shading installed on the windows. This lowers the temperature a few notches without increasing the air conditioning bill. “And finally, LED lighting fixtures have been installed, thus lowering electricity costs and ensuring that our airport terminal is more environmentally friendly. “Overall, we’ve spruced up the existing facility to provide you, the customer, with a much better experience as we await our new, world class passenger terminal in 2020. I’m glad they’re prettying the place up but it still leaks more than the Sea Venture. Dont take a rocket scientist to fix a leak. Great job Skyport and Mikaela. These videos are super informative, and its great to let everyone know the progress being done. Keep up these videos, we love seeing them. I agree, super informative is a word that was missing for 5 years, too bad the former Government let it deteriorate to a point that they convinced us we need a new airport ASAP. Just like they let the buses and trash trucks deteriorate to a point to convince us they have to privatize them. But we paid for a sucessful sailboat race for Billionaires after seniors were told money dont grow on trees.